1 of 4 In a large bowl, whisk together soy sauce, vinegar, honey, ginger and sesame oil. Add scallops and toss to coat. Cover and refrigerate for 30 minutes. 2 of 4 Heat a large nonstick skillet over medium-high heat. Add scallops, reserving marinade; cook scallops 3 minutes per side. Remove and place on a plate. 3 of 4 Pour reserved marinade into same skillet and boil 1 minute. Return scallops to skillet and heat through, coating with sauce. 4 of 4 Equally divide pasta among four plates and drizzle each with sauce from skillet. 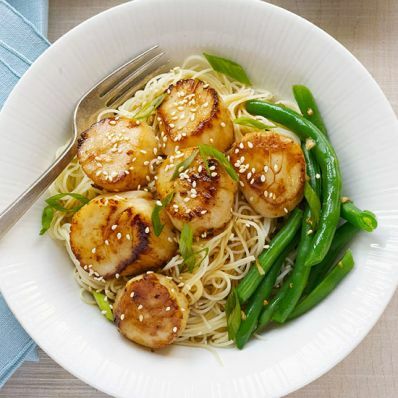 Place about 6 scallops over each serving and garnish with scallions and sesame seeds. Serve with Garlic String Beans. Per Serving: 731 mg sodium, 4 g fiber, 9 g Fat, total, 63 g carb., 38 g pro., 495 kcal cal., 1 g sat. fat, 56 mg chol.